My favorite dish on a chilly fall day. You’re going to fall in love with this ginger tomato recipe! The tomato is a fruit I can eat most anytime of the year. In fact, it doesn’t matter if the produce comes from the local market or my home garden it is a treat to have on the menu. Below is the Ginger Tomato Recipe that can be found on page 90 in the”Tomatoes: A Savor the South Cookbook” by Miriam Rubin. Surely, you will want to follow the recommendations and Dish It Up Hot Year-round at your next meal. I just had to share this photo from a hot day in my Ohio home garden. My kitty Grace specifically loves to help me when I’m in the garden on a hot summer day . As you can tell in the photo she doesn’t mind getting in the soil with me to harvest these tasty treats. It’s so cute how dedicated to gardening she is and yet she doesn’t heat the harvest! Of Course with all the varieties of tomatoes on the market these days dish it up hot year-round with this easy recipe. Beautiful harvest of tomatoes featured in this recipe. Miriam Rubin. Used by permission of the University of North Carolina Press. Heat the olive oil in a large, heavy skillet over medium-high heat. Add the garlic and ginger and cook, stirring, just until fragrant, about 1 minute. Add the tomatoes, sprinkle with the salt, and cook, tossing often, until they just start to collapse, 2@-4 minutes. Remove from the heat. Add the honey, sprinkle with the chives or scallions, and mix gently with a rubber spatula. The more you stir, the juicier they get. 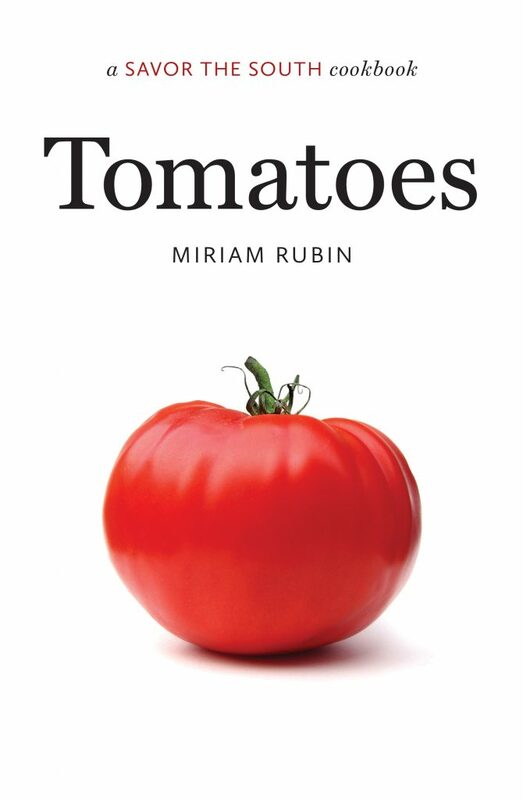 Because of my passion for tomatoes, Author Miriam Rubin’s book “Tomatoes: A Savor the South Cookbook” never gets put on the book shelf to collect dust. Daily the publication inspires new flavor combinations with healthy ingredients from garden to table. In other words this is a book I can’t just pick one favorite recipe. Dish it Up Hot at your next meal as a side dish. You can find this publication featuring Ginger Tomato Recipe at http://uncpress.unc.edu/books/10104.html or customers can buy this product on Amazon. [alert-warning]Do you have a favorite tomato to grow or purchase at the market? What do you think of all the different colorful tomatoes available for gardeners?